A lot of people is complaining lately due to the new notifications that Twitter has activated by default to everybody, specially the "I'm sent a reply or mentioned" one. Most people wonder why they did this on by default when is so annoying. Well, I'm 99% sure this is due to one simple reason: increase engagement. All major social sites (Twitter is not a social network but it is indeed social) have this kind of notifications, and the goal is always the same. Try to get users more engaged and active using the service. If you're travelling and you receive an email that one of your friends is mentioning you, chances are high you will check your Twitter asap to see what they were talking about (even if you can see the full tweet with your mention in the email, you don't see the full conversation thread). Maybe not instantly, maybe in one hour, but you will be eager to see it. But engagement is not only about increasing active user's usage time of the service. It also means something very important: Trying to take back inactive users. Maybe you got tired of Twitter, or maybe you just were testing it but not found enough relevant information and left it. But if suddenly there is activity related with you (mentions) or with your tweets (retweets, favourites), then you might be more inclined to check again, chat a bit with the source of the notification, and maybe start using the service. Facebook, Tuenti and other social networks do something similar but less aggresive: Send a "friend updates" email after a given period of inactivity. Is just one small summary but the goal is to wake some interest on the recipient to login and check in detail the news (and hopefully come back or become at least more active). 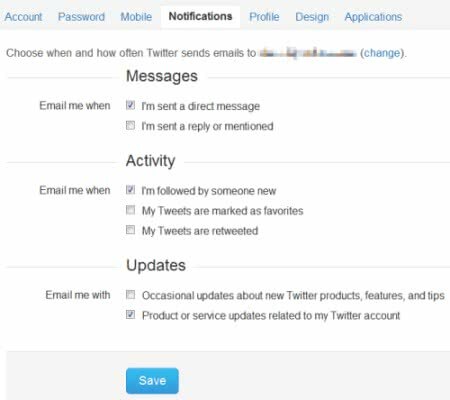 So yes, it is annoying for us the users, but it is a common practice and we will probably keep having "new notifications" on by default on most services, not only Twitter's. Engagement is very important for social sites and every technique to boost it will be applied.